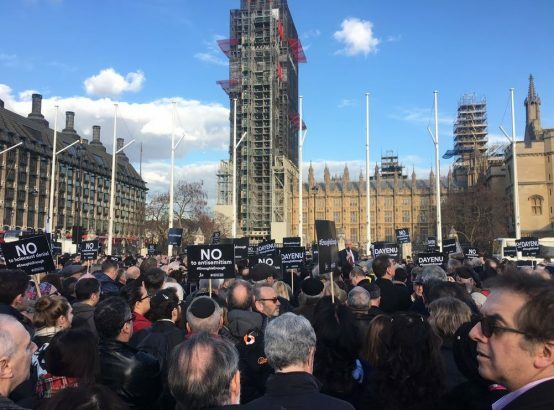 Antisemitism protest outside Westminster, 26 March 2018. Carrie Symonds. Twitter. A belief in the basic justice of the Zionist cause – i.e. the legitimacy of Jewish statehood in the Land of Israel. 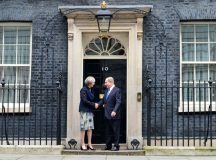 A deep connectedness to Israel as part of British Jewish identity and an instinctive protectiveness towards it. A personal connection to Israel created by meaningful, memory-making time spent in Israel, combined for many British Jews with a family connection. An unease at some government policies, for instance concerning settlement expansion and the inequalities between Jewish and Arab citizens of Israel, but also a feeling that ultimately only Israelis can be responsible for Israeli policy. 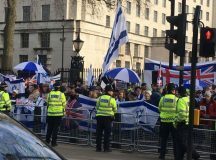 A willingness to hear and engage with a range of views on Israel within the community, but an unwillingness to broach major dissent over how the community/communal leadership defends Israel to the wider British public. A sense that Israel is judged unfairly in the court of public opinion, however no illusion that Israel is somehow a perfect, ideal society. Theoretical support for a two-state solution, but without much clarity as to what this might actually demand of Israeli or Palestinian leaderships or publics in practice; coupled with a non-negotiable concern for Israel’s security. A pride in Israel’s accomplishments. Of course, there are Jews to the ‘right’ and the ‘left’ of all of these positions, but I would imagine that the above represents ‘middle Anglo-Jewry’. RM: I think that questions of (un)acceptability and (in)effectiveness are linked but separate, so I will take each in turn. My view is that there is a distinction between what individuals choose to do and what happens when they are either part of a broader organisation or claim to represent ‘the community’. I would have a quite wide tolerance for individuals protesting against Israeli government policy. No government is above reproach and no policy is beyond critique. Jews, as stakeholders in the project that is Israel, have a right to have their voices heard. Note that I use the term ‘stakeholder’. We are not shareholders – we don’t have a vote at the AGM (elections), elect the board (government) etc. We do, however, have a stake in Israel, wherever we live, and so whilst we don’t have a veto or a vote, we absolutely should have a voice. I think that such criticism should be framed in a positive, constructive way rather than simply being a chance to pour vitriol on Israel. Makom, the Israel Engagement think/do-tank within the Jewish Agency describes this as ‘bettering, not battering’ Israel. The challenge comes when one decides to engage in activism on behalf of other people. If you are part of an organisation, then you have to be mindful of the values and interests of the organisation as well as your own. All organisations should be internally pluralistic, of course – otherwise they are cults. But when one acts in the name of an organisation without a full consideration of what that really implies, I think that can be unacceptable. The obvious example here is if an organisation self-defines as ‘Zionist’. What does that mean? There are a wide range of meanings of the term ‘Zionist’. But not an infinite range. It is for Zionist organisations to have nuanced conversations internally, and to engage with the broader Zionist community, to determine what it might mean. 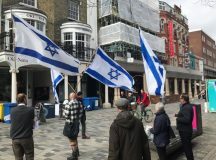 I’m not the ultimate arbiter of Zionism however I am uncomfortable when some British Jews use the fact that they are part of a Zionist organisation to, for instance, justify hateful personal abuse of others. I don’t care if you are the greatest Zionist with the most memberships of Zionist organisations in the world. Abuse is wrong. Full stop. In terms of efficacy, I have to say, I’m probably more cynical than most. The Israeli government of course has in the past changed course because of conversations with Diaspora Jewish communities. But in the main, the Israeli government has little concrete record of responding to Diaspora Jewish concerns – from the left or from the right. I went to a fascinating educational session at Limmud Conference a few years ago about why, in the view of the presenter, it was a scandal that Jews could not pray on the Temple Mount. A number of the people in the audience described how they had raised this issue again and again with their Israeli friends and in some cases with Israeli governmental contacts they happened to have. And all for naught. Israel will do what Israel sees as in Israel’s interests. That doesn’t mean that protest or campaigning are not worthwhile, especially if they are partnered in a meaningful way with Israelis who believe the same things. 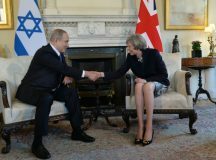 In general , I don’t think that critique of the Israeli government by British Jews is very effective. RM: This is of course a tough question. A principled, nuanced position can easily be taken wildly out of context and we can all think of examples when people who mean Israel nothing but harm have twisted Jewish criticism of Israel that comes from a place of love and concern, for their own ends. I certainly think that the idea that we have no responsibility is wrong. Jewish terms such as klal Yisrael [community of Israel / the Jewish people] and ahavat Yisrael [love of Israel / the Jewish people] are important and meaningful values and in practical terms. It is unreasonable to claim that one couldn’t possibly have known how one’s words might be used. In this day and age, what one says and to whom are equally important. I think the key distinction is between what one means and what one says. I don’t think Jews should be self-censoring their basic positions on matters of controversy, be that about Zionism or Israeli government policy. But I do think Jews should be careful how they say it. For instance, within most (though not all) Jewish-only spaces, a certain set of presumptions are implicit and norms are shared. One doesn’t need, for example, to continually say why after the Shoah, Jews felt so vulnerable and powerless. This is taken for granted. So one might frame a critique of Israeli security policy without explicitly stating that. Having said that, Jewish Israelis absolutely have a well-founded historical traumatic fear of violent attack and ultimately annihilation. Making the same critique in a non-Jewish-majority space without any reference to, and therefore acknowledgement of, Israeli Jewish existential fears, to me, however, would be mistaken. Finally, if it is discovered that true enemies of Israel are using one’s views in a manipulative way (particularly as cover for hatred – that appalling way that ‘look, even the Jews are saying it, so it’s fine’ discourse often plays out), I think one has a responsibility to make it clear that you have been misunderstood and taken out of context. I’m thinking, for instance, about when Natalie Portman turned down the Genesis Prize in April 2018. BDS activists jumped upon her decision as justification for their campaign. Portman very quickly, and very publicly, made it absolutely clear that what she was doing had nothing whatsoever to do with BDS. 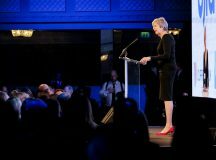 British Jews may reasonably agree or disagree with her decision to not accept the Prize; but the important thing is that she decisively drew a line between her actions and the BDS movement. RM: I think that the coming years, as the ‘Millennial’ generation takes on increasing positions of leadership within British Jewry, will see both seismic change and remarkable continuity. I was born in 1986. I went on my first youth movement summer camp when I was 13, just after my Bar Mitzvah. It was July 2000. I have a clear memory of sitting on the grass at the camp in the sun, with the shlicha (Israeli educator from the Jewish Agency) telling us some very exciting news. ‘At this very moment,’ she told us, ‘in a place called Camp David in the USA, the Israeli and Palestinian leaderships are talking directly about how to end the conflict. And like many Israelis, I’m both excited and confident that very soon – possibly by the end of this very camp – they might succeed. The conflict might end. Peace might come’. I believe that I am quite literally the last generation of young British Jews whose formative Israel education could in all good faith be framed in that way, at least for the foreseeable future. I’m not getting into a blame game, but my point is this: the Israel conversation has changed. Its starting point is different. What it means to be an ‘optimist’ about Israel is different than it once was. And as more and more people my age and younger take control of the discourse (accelerated, of course, by social media), change is inevitable. Today’s young British Jews are, on the whole, more politically ‘left-wing’ (in Israeli terms) than their parents and grandparents. This, combined with the current lack of a substantive peace process with the Palestinians, will definitely affect communal discourse around Israel. The ‘boundaries of the tent’ have already shifted. That shift will only accelerate as the years go by. Of course, the generation below me is different again. When I speak to today’s teenage British Jews, there does seem to be polarisation going on. Some are angry – they are angry about antisemitism within elements of British society, angry that (as they see it) our communal organisations are too meek and timid and angry at what they see as an unwarranted left/liberal consensus amongst the communal leadership. This may or may not be fair. But it is how they feel. Others are angry – they are angry about the seemingly-ever-deepening entrenchment of Israeli control of the West Bank, of settlement expansion, of discrimination against Arab citizens of Israel, of illiberal legislation passed by the Knesset and of what they see as the British Jewish establishment’s tacit support or supine lack of opposition to all of this. This may or may not be fair. But it is how they feel. Much more attention is paid to second group than to the first, but both exist and are growing all the time. Whilst they would probably have little else in common, both are united by a profound and (if we are not careful) extremely damaging anti-institutionalism. 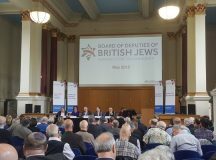 They don’t want to reform or rejuvenate the communal organisations that for 100 years have mediated (in my view quite effectively, all things considered) the relationship between British Jews and Israel and facilitated (again, in my view quite effectively, all things considered) the internal communal dialogue about Israel. They want to tear us down. Replacement and revolution, not repair or evolution, are their watchwords. And yet – in other ways, things aren’t actually changing very much at all. Young British Jews, overwhelmingly, are spending time in Israel. They are going more often and in an ever-widening variety of frameworks. Easyjet and Wizzair have made Israel more accessible than ever. Aliyah is basically steady (far more a trickle than a flood). 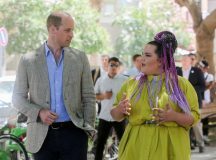 Israeli culture – food, TV, films, celebrities – is increasingly normalised within British and British-Jewish society. The outpouring of joy at Neta’s victory in the 2018 Eurovision Song Contest was nearly universal amongst young British Jews – there are still many things for them to celebrate. 1100 British Jews went to Israel through our wonderful youth movements this summer. How many went in 2005? 1100. In 1997? 1100. The ‘Israel Experience,’ a framework operated by the Jewish Agency that UJIA has been proud to support and sustain for many years, is one of our community’s flagship projects. Long may it continue. So both continuity and change. 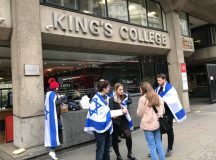 Maybe, in this age of polarisation and either/or, British Jews’ connection to Israel will buck that particular baleful trend.